Sorry, but Avery Neck Hanging Lanyards (2pk) - 74458 is no longer available to buy. Ever forget where you put your keys? 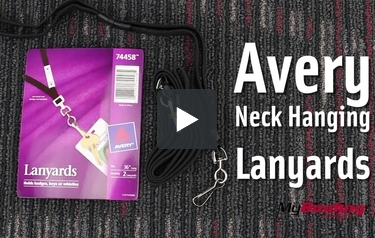 You won't misplace them again with these Avery Neck Hanging Lanyards. They keep keys, identification badges, whistles and other small items in a safe place and within reach. And the safety-conscious breakaway clasp comes apart in case the lanyard gets caught. Throw in a sturdy, easy-to-use clip and there's no excuse not to wear these handy Avery lanyards every day. Hands-free, convenient access to must-have accessories. These 35-1/2" long Avery lanyards are as convenient as they are handy. Order this pack of 2 lanyards now. Transcript: These are Avery Neck Hanging Lanyards! They are a black lanyard with a swivel hook on the end. The break away strap takes any worry out of the lanyard becoming a choking hazard. It breaks apart, and is easily put back together. Attach a badge or holder to easily display your credentials. Here is a close look at the swivel hook. Now for my new male modeling career! It holds strong, though a gentle tug will break it away. Snap it back on with ease and off you go again! These are Avery Neck Hanging Lanyards!